By 1977, Adelbert Von Deyen was working as a retoucher for a Berlin newspaper. While this kept him busy during the day, Adelbert had plenty of free time in the evenings. Wanting to put his free time to good use, Adelbert decided to take up a hobby. The hobby Adelbert Von Deyen chose was music. This was no surprise, as at that time, Berlin had a thriving music scene. Many of the Krautrock bands, were formed in Berlin. 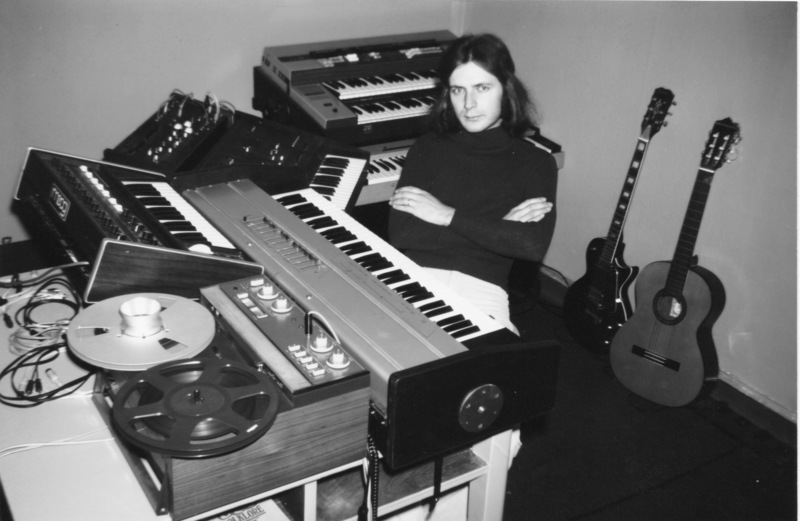 Meanwhile, Tangerine Dream, Klaus Schulze, and Manuel Göttsching were pioneering the Berlin School of electronic music. However, Adelbert Von Deyen didn’t just want to listen to the music being made in Berlin, he wanted to make music. The type of music Adelbert Von Deyen wanted to make was electronic music. So he began to working out what type of equipment he would need to buy. Having made a “shopping list” of equipment, Adelbert headed out and bought a second hand synth, a Revox A77 tape recorder and keyboards. Little did he realise that this was just the first of numerous shopping trips he would make. Having started making music in the evenings as a hobby, gradually Adelbert Von Deyen was bitten by the music making bug. Soon, he was adding new pieces of equipment to his home studio. This meant making sacrifices. Sometimes, when Adelbert hadn’t enough money to buy new pieces of equipment, he borrowed from the funds from the bank. Adelbert was dedicated to making music. When he returned from work each night, Adelbert Von Deyen began making music. He often worked late into the night, and sometimes, into the early hours of the morning as he perfected his elegiac soundscapes. This took time, patience and determination. After eight months, Adelbert Von Deyen had finished his first compositions. He decided to tape the compositions, and send a copy to various German record companies. Maybe he hoped, one of the record companies would interested in his album? This was a long shot. Adelbert Von Deyen was a new artist, who had only been making music for eight months. However, it was a case of fortune favouring the brave. One of the record companies Adelbert Von Deyen had sent his tape to, was Hamburg based Sky Records. They had been formed just three years earlier, in 1975 by Günter Körber. Since then, Sky Records’ had only released eighteen albums. However, Sky Records had released albums by Bullfrog, Streetmark, Wolfgang Riechmann, Michael Rother, Cluster, and Hans-Joachim Roedelius. This was already an impressive roster, and one that many musicians were keen to sign to. Sky Records had already established a reputation for releasing groundbreaking music. Just like most record companies, Sky Recordswere being sent many tapes during 1978. Usually, the tapes would range from good and bad to indifferent. One of the tapes that Günter Körber had been sent was Adelbert Von Deyen’s. Having listened to the tape, Günter Körber made the decision to add a new name to the Sky Records’ roster,.. Adelbert Von Deyen. Günter Körber contacted Adelbert Von Deyen to offer him a recording contract. Sky Records were willing to record Adelbert Von Deyen’s debut album worldwide. 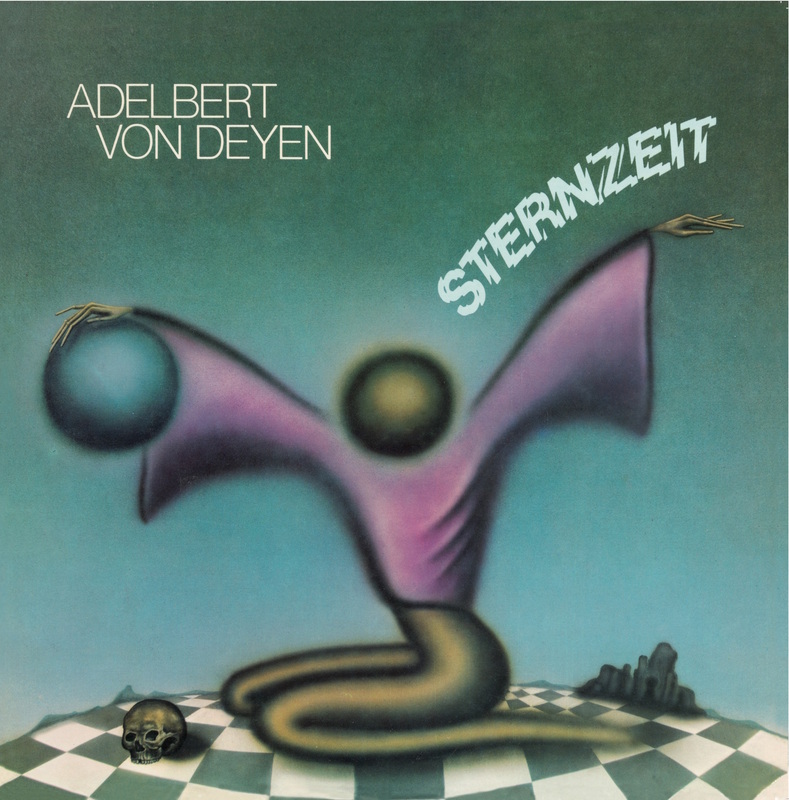 The as yet unnamed album became Sternzeit, which featured a distinctive cover painted by Adelbert Von Deyen. 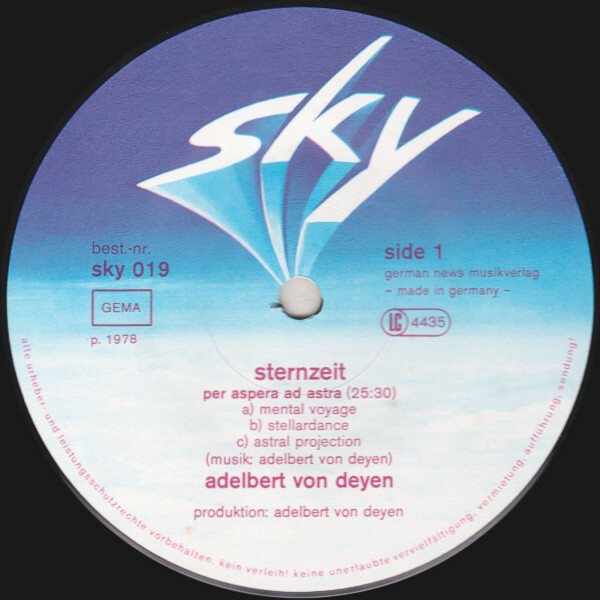 Sternzeit which was recently reissued by Bureau B, was the first of nine albums Adelbert Von Deyen released for Sky Records between 1978 and 1985. Many of these albums contained groundbreaking music, including Adelbert Von Deyen’s debut album Sternzeit. Sky Records’ release of Sternzeit rewarded all the time and effort Adelbert Von Deyen’s had spent recording his debut album. From March to August 1978, Adelbert worked on the two lengthy tracks that became Sternzeit. They were Per Aspera Ad Astra ,which was a three-part suite, featuring Mental Voyage, Stellardance and Astral Projection. Then on the second side of Sternzeit was the title-track a twenty-five minute epic. These tracks were recorded in Adelbert new home studio. Although Sternzeit was recorded in his home studio, Adelbert Von Deyen had access to an enviable array of equipment. This included a myriad of strings including an ARP Odyssey. They were joined by synth strings, an organ, electric piano and electric guitar. Adelbert Von Deyen played each instrument, and produced Sternzeit. Once the album was recorded, it was mixed at Star-Studio, in Hamburg. Now Sternzeit was ready for release. When Sternzeit was released later in 1978, it was well received by critics. Sternzeit sold reasonably, well and certainly was more successful than many Krautrock and Berlin School albums. It was only later that Adelbert Von Deyen’s music would receive the credit and critical acclaim it deserved. By then, Adelbert Von Deyen was regarded as one of the leading lights of the Berlin School. His music was innovative and would go on to influence further generations of artists. This included Adelbert Von Deyen’s debut album Sternzeit. Opening Sternzeit is Per Aspera Ad Astra, the three part suite, where Mental Voyage, which gives way to Stellardance and Astral Projection. Slow, spacious and ambient describes the introduction, as lone keyboard plays, while a guitar is strummed carefully. To this, occasional bursts of sci-fi synths are added. Less is more, as the arrangement meander along. An electric piano plays, adding a melancholy and mesmeric backdrop. As it taps out a code, subtle washes of synths sweep. Again, the sci-fi synths make a brief appearance, as the drama builds. Soon, an elegiac cinematic sound has emerged, and washes over, and cocoons the listener. Gradually though, an organ adds to the drama, while futuristic sounds bubble and a pulsating synth provides the heartbeat to what could be the soundtrack to a sci-fi film. From there, the arrangement ebbs and flows, with drama, beauty and sci-fi sounds omnipresent. Later, the music becomes shrill and adds to the drama that’s unfolding. There’s also a ruminative, melancholy and darkness to as Adelbert Von Deyen paints pictures and sets the listener’s imagination racing during this epic three part twenty-four minute musical suite. The title-track closes Sternzeit. A synth hisses, quivers and shimmers, before growing in power and drama. The tempo is slow, but there’s an element of drama as the edgy arrangement eddies. Gradually, synth strings are added, and become the counterpoint. Still, the arrangement buzzes and quivers, as it continues to drone. Meanwhile, subtle layers of synth strings and the organ sit below the main part of the arrangement gradually revealing. At 9.51 wistful keyboards are added. Still the arrangement drones and buzzes. though the synth strings and organ grow in power. However, the arrangement is still dominated by buzzing, drone. It’s joined by a variety synths and keyboards as the drama continues to build. There’s more to the arrangement than meets the eye. It’ll take several listens, before the arrangement reveals all its secrets and subtleties. Right up until the closing bars, the drama builds during this compelling cinematic opus that sounds as if it belongs on a sci-fi drama. Adelbert Von Deyen went on to release nine albums on Sky Records. His first five albums contained his most groundbreaking music. This includes the followup to Sternzeit, Nordborg, which was released in 1979. The as the seventies gave way to the eighties, Adelbert Von Deyen’s rich vein of form continued, with Atmosphere in 1980, Eclipse in 1981 and Planetary in 1982. That wasn’t the of Adelbert Von Deyen’s career at Sky Records. He remained with the label right through until the release of his ninth solo album Dreamdancer. After leaving Sky Records, Adelbert Von Deyen didn’t release another album until Painted Black in 2006. It was released on Adelbert Von Deyen Productions. So was 2007s Roseg@rden, and Adelbert Von Deyen’s 2009 collaboration with Dieter Schütz, Old Fashioned. Thirty-one years after the release of Sternzeit, Adelbert Von Deyen continued to release ambitious albums. That had been the story of musical career. Especially, the early years of Adelbert Von Deyen’s long and illustrious career. He continued to release innovative music that would influence further generations of musicians. 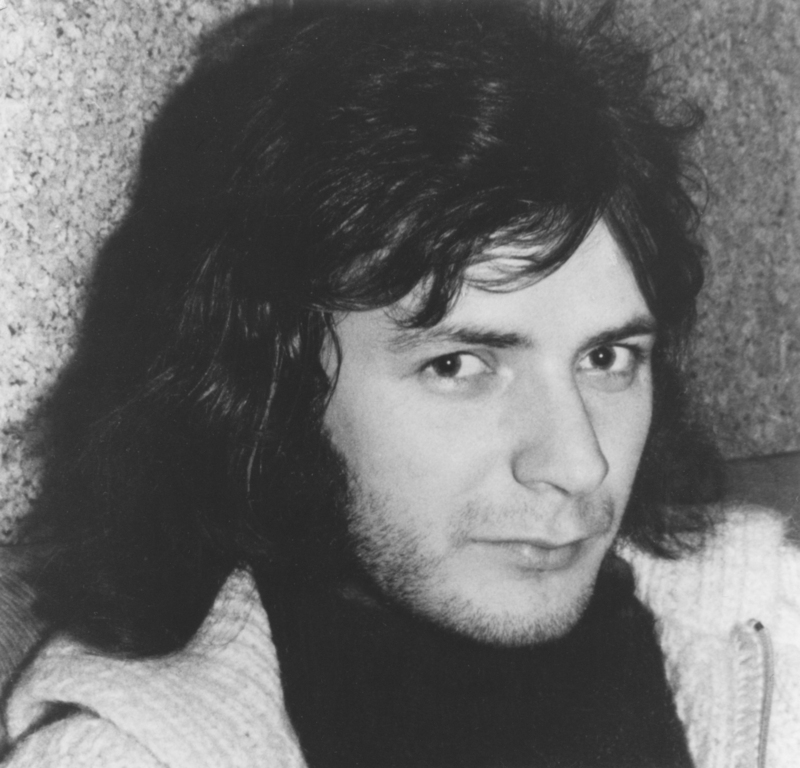 However, the most fruitful period of Adelbert Von Deyen’s career was the quintet of albums he released between Sternzeit in 1978 and Planetary in 1982. They feature a musical pioneer as he hits a rich vein of form and his creativity blossoms. ← TED COLEMAN BAND-TAKING CARE OF BUSINESS-VINYL EDITION.